It’s rare for the Atlantic 10 Conference to start before New Year’s Day but the 2016-17 season did just that on Friday as Duquesne traveled to The Bronx to play Fordham. The Dukes had the lead for the bulk of the game but fought back against a ferocious second half rally from the Rams and started their 2016-17 conference season with a win, 75-72. Duquesne (8-6) quickly established dominance around the rim and bullied the Rams in rebounds and easy putbacks. Fordham’s man to man defense gave the Dukes opportunities to use backdoor cuts for easy baskets. They scored 18 points on layups while outrebounding the Rams 35-14 in the first half. It didn’t look like Fordham (6-8) would be competitive as Duquesne took a 40-28 lead into halftime. The only bright spot for the home team was Will Tavares coming off the bench and contributing 8 points. The Rams made some key defensive adjustments in the beginning of the second half and immediately cut Duquesne’s lead to 5, 42-37. As the small but vocal crowd at Rose Hill Gym started to rally the Rams, the Dukes again went up by ten on Kyle Abrahamson’s three pointer. 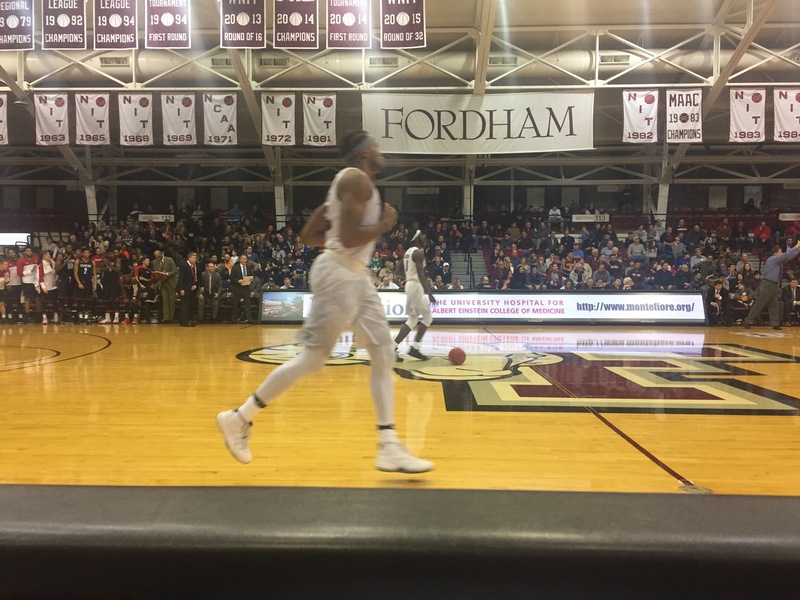 Fordham had one more run in them and Antwoine Anderson’s three point play with four minutes left gave the Rams their first lead (65-64) of the game. The lead was very short lived as Duquesne’s Mike Lewis II hit a three pointer with 2:06 left in the game to put the Dukes ahead for good. The Dukes hit six free throws in the last ninety seconds and prevailed 75-72. Emile Blackmon had 17 points for the Dukes. Abrahamson had his first career double-double with 12 points and 10 rebounds. Javonte Hawkins had 18 points for the Rams to lead all scorers. Fordham has lost 6 of it’s last 7 games and will try to get their footing back at Richmond on Wednesday.